Start flipping a coin. How long should you wait (on average) before observing the pattern !? 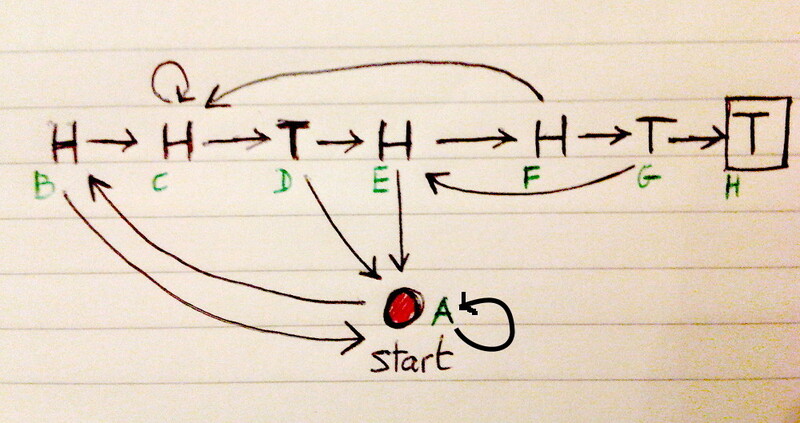 Easy you might say, that’s simply the hitting time of the state starting from state of the following Markov chain. After a finite amount of time and coffee one then come up with the answer . That was a little bit tedious and I don’t really want to know how long one should wait on average before observing the sequence . where if the gambler is still in the game after the round and otherwise. The fundamental remark is that the quantity is not random so that . Indeed, right after round one can know with certainty whether is still in the game or not. Gambler is in the game only if the last letters of the magic word are the same as the first letters. For example, if the magic word is then the gamblers who have seen the pattern , and at time are still in the game when the magic word first appear. In this case this shows that . For example, this immediately shows that we have to wait on average coin tosses before observing the pattern . hi, you do had a great site, thank for sharing these valuable information. Hello, This is a nice information, thanks.